Fifty years after President Lyndon B. Johnson signed the 1964 Civil Rights Act into law, there still remains gaps between blacks and whites on many social and economic measures. Our Chart of the Week looks at one of them: the higher incarceration rates of black men compared with those of white men. 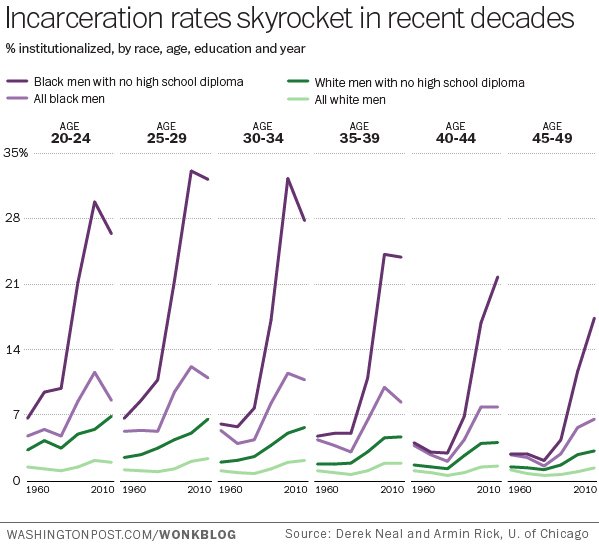 The above graphic from the Washington Post’s Wonkblog shows that black men in their prime working years, especially those without a high school diploma, are much more likely to be in jail than white men are. While institutionalization rates rose for both blacks and whites from 1980 to 2000, it was especially sharp among the less educated black men – rising from 10% in 1980 for those ages 20 to 24 to 30% in 2000. In 2010, the institutionalization rate for this group dropped to 26%, but, as was the case in 2000, they were more likely to be institutionalized than they were to be employed (19% employment rate in 2010). Institutionalization and employment trends were similar, if not more dramatic, for black men with no high school diploma ages 25 to 29. The chart is based on a study by University of Chicago economists Derek Neal and Armin Rick, who tabulated Census Long Form data from 1960 to 2000, and American Community Survey data from 2010. Neal and Rick’s study was in part a follow-up to a 1989 paper by James Smith of the RAND Corporation and Finis Welch of UCLA, which found substantial progress in closing the black-white gap in education, employment and earnings from 1940 to 1980. But in the U. Chicago study, Neal and Rick concluded that progress on similar measures have sputtered since 1980, in part because of the disproportionately high incarceration rates. They noted, for example, that while employment rates for all men had declined since 1980, “these declines in employment and increases in incarceration have been much more dramatic among black men than white men.” The authors attributed part of this trend to the change in prison policies in the 1970s and 80s. In 2010, all black men were six times as likely as all white men to be incarcerated in federal, state and local jails, according to a 2013 Pew Research Center study. We also found that black-white gaps in median household income and wealth had widened in recent decades, while gaps in high school completion and life expectancy had narrowed. In last year’s survey, fewer than half of all Americans (45%) said the country has made substantial progress toward racial equality, and 49% said “a lot more” remains to be done.